One rainy afternoon in Rome I went out in a taxi to circle the huge park, surrounded by a high wall, where Mussolini’s house stands alone amid a grove of trees. The house was hidden from view, and the trip would not have paid out in results except for the presence along the sidewalk beneath the wall of a detail of cutthroats the like of which has not been assembled under one command since the days of His Majesty’s British Black and Tans. Mussolini’s household guards were stationed at intervals of about fifty yards all around the park, each under his umbrella in a drizzle, all keeping up a nominal pretense of waiting for a street car, of which there was none in that vicinity, or for a friend, of which there can be none on earth. There were other secret policemen on the far side, one carrying a suitcase which could have contained the conventional Tommy gun. This one was strolling up the block the first time I passed. When I came around again he was strolling the other way with his suitcase. They were a homey touch, in a way, for they were the first of that type that I had seen in several weeks in Italy, and for a moment I thought I was back in Miami Beach, Fla., in the winter colony of the artichoke and slot-machine aristocracy of our Northern cities. At a distance, and in print, the castor-oil treatment with which the Black Shirts overcame political doubt seems not very brutal and even slightly humorous. But at close quarters, as the boys peered out from underneath their dripping umbrellas, it was not so easy to see the joke. The customary procedure of these missionaries is to call at night in a body on the victim of a political error, twist his arms and legs until the bones crack, then pour down his neck a quart of castor oil which may be mixed with kerosene. It is inartistic to use kerosene, however, for enough castor oil taken all at once is almost certain to rupture the human plumbing and to bring about death from natural causes within a few days. There is always plenty of castor oil. A few days later, on a trip to Pontinia, the tailor-made village which Mussolini built on a reclaimed swamp somewhat resembling the Florida glades, the strong-arm detail was out again, this time in greater numbers, and the scene was pleasantly reminiscent of those Kentucky Derbies at Louisville in the days of prohibition when all the Italian alky cookers and bootleggers east of the Rocky Mountains gathered for their annual convention. They were everywhere. They mingled with the crowd and climbed the steps to overlook the press of people. They sidled up and looked earnestly into your eyes and gazed at your camera and studied your overcoat for bulges. I felt nervous, for we had left Rome in the dark at 7a.m. without breakfast, and I had in my pocket an eating apple whose contour might have suggested the hoodlums’ pineapple. This trip was organized after the fashion created by the late Tex Rickard when he was conducting ballyhoo parties for sports writers to the training camps of his fighters. Mussolini has a special preference for the foreign press on such occasions, for he has the natural desire that his achievements in this great reclamation work shall be known in other lands. He has salvaged the swamps, built several towns, and lifted whole communities out of their old surroundings, to set them down in a new country where everything is ready for life. It is the kind of work that we in America are always going to do. Consequently, the petty Mussolinis of Mussolini’s foreign press bureau, so lazy and stupid most of the time, round up all the foreign representation they can find when the Duce is about to put on one of his shows. If they don’t turn up with enough foreign press, Mussolini gets sore and gives them hell. So there were about fifty of us on this trip, and we all had a long look at the Duce putting on his No. 3 routine. This is the one in which he is a kindly man of the people, and the living spirit of a proud and mighty but friendly race demanding only justice for Italy. It is said to be the best act in his repertoire, and I will say that I have never seen anything of its kind, although Red Mike Hylan, when he was Mayor of New York, resembled Mussolini around the ears. 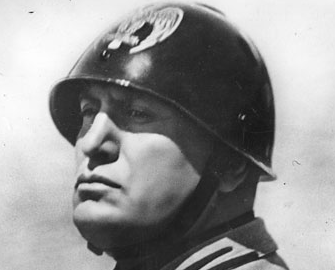 His face surprised me, for I had expected a popeyed glare, an undershot jaw and the generally bloodthirsty mien, whereas there was a soft expression in Mussolini’s eyes, he spoke in a quiet, civil tone, and his lips parted in a smile three or four times. His eyelids were red, as though he had been working nights. But the Black Shirts told me Mussolini never gets tired. His eyelids are naturally red. A Frenchwoman journalist stepped out and dropped her wedding ring into his hand for his gold collection. Mussolini said he was touched, and went away in a pleasant mood. It was strange to feel drawn to this man, knowing that a word from him might cause another world war any minute, and that down in the village street and all over the place were those plain-clothes missionaries of his who might rub against that apple any minute and take impulsive steps.